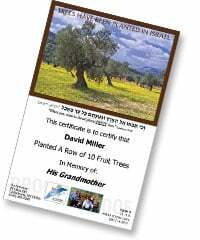 70 Orchards for Israel’s 70 Years! Make the Land of Israel More Beautiful! Get your congregation and community involved today. They could join by planting their very own orchard! Email unitedwithisrael@israeltrees.org for more info. Make the Land of Israel even more beautiful. Planting is Now! LAST CHANCE: 70 Orchards for 70 years! Let’s show honor and love by celebrating Israel’s 70th Birthday in a very special way. Get your congregation and community involved today. They could join by planting an entire orchard!